Within a 40 minute drive of La Vecchia Scuola lies some of the most dramatic coastline in Italy, complete with superb beaches. Just south of Ancona rises the solitary limestone peak of Monte Conaro whose sheer slopes drop down to the translucent waters of the Adriatic and some of the prettiest beaches of the area. 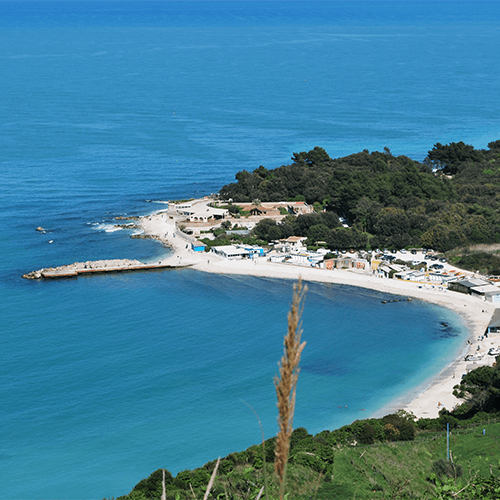 The first port south of Ancona is Portonovo, the smallest resort on the Conero Riviera. You can dine on exquisite fresh seafood, washed down by the local verdicchio white wines, at restaurants perched at the water’s edge, with the stunning backdrop of the steep cliffs behind you. Further south are the two better known resorts, Sirolo and Numana. Sirolo boasts a pretty medieval centre, and both locations provide accommodation ranging from campsites through to luxurious hotels. Some of the more isolated coves can be reached only by boat, an ideal arrangement for those who prefer to avoid the more popular beaches. Sirolo also has one of the few golf courses in the area.